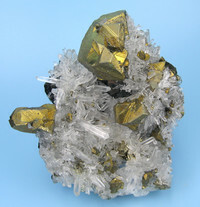 Twinned crystals of chalcopyrite set upon a transparent and colorless crystallized quartz base, that completely covers a massive sphalerite matrix. Overall size: 70 mm x 63 x mm 33 mm. 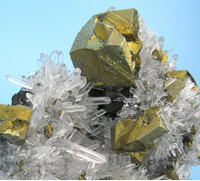 Main chalcopyrite crystal: 27 mm. Weight: 99 g. Until 2007 it was in the Dawn and Jim Minette collection, Boron, California, ref. #WW409.